Connectors on a page can either intersect as straight crossing lines or as line jumps. You can change the line jumps setting for a diagram or change the default setting. 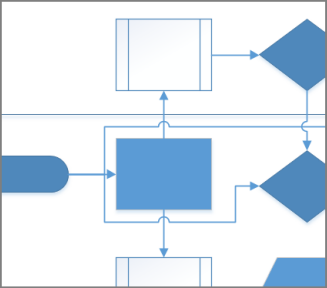 As you edit a diagram and add more shapes, you may want to create line jumps when connector lines cross. You can show or remove these line jumps. To show jumps over crossing lines, select Show Line Jumps. To remove jumps over crossing lines, clear Show Line Jumps. 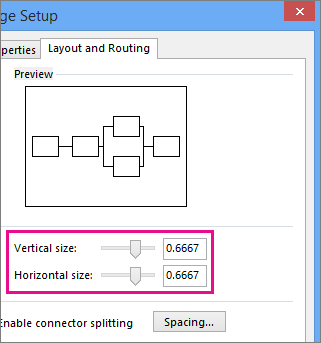 In the Page Setup dialog box, click the Layout and Routing tab, and under Line jumps, configure options and sizes. Add line jumps to lets you specify which lines jump. For example, assign jumps to all horizontal lines, or the line added more recently. Line jump style lets you specify the shape of the jump, such as a smooth arc, a gap, a square, or a multi-sided arc. Use the sliders, or enter numbers, for Vertical size and Horizontal size to specify the size of line jumps for vertical and horizontal connector lines. Click the Layout and Routing tab. Under Line jumps, in the Add line jumps to list, select None. Select the connector whose line jump style you want to set. On the Format menu, click Behavior. Click the Connector tab, and under Line jumps, select the options that you want. 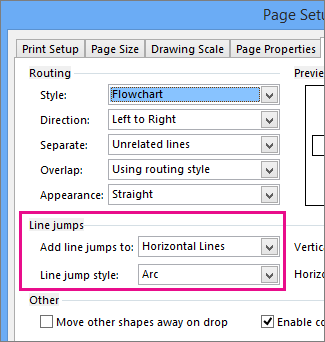 Tip: To set the default line jump style for connectors on the page, on the File menu, click Page Setup, click the Layout and Routing tab, and in the Line jump style list, click the way that you want the line jumps to look.